Sometimes we are interested in the current i in a particular conductor. At other times we take a localized view and study the flow of charge through a cross section of the conductor at a particular point. To describe this flow, we can use the current density 7, which has the same direction as the velocity of the moving charges if they are positive and the opposite direction if they are negative. For each element of the cross section, the magnitude J is equal to the current per unit area through that element. We can write the amount of current through the element as 7 .dA, where dA is the area vector of the element, perpendicular to the element. The total current through the surface is then. where A is the total area of the surface. From Eq. 27-4 or 27-5 we see that the S[ unit for current density is the ampere per square meter (A/m~). In Chapter 23 we saw that we can represent an electric field with electric field lines. shows how current density can be represented with a similar set f lines. which we can call streamlines. The current, which is toward the right in 4, makes a transition from the wider conductor at the left to the narrower conductor at the right. Because charge is conserved during the transition, the amount of charge and thus the amount of current cannot change. However, the current density does change-it is greater in the narrower conductor. The spacing of the team lines suggests this increase in current density: streamlines that are closer together imply . greater current density. When a conductor does not have a current through it, its conduction electrons move randomly, with no net motion in any direction. When the conductor does have a current through it. these electrons actually still move randomly, but now they tend to drift with a drift speed I’d in the direction opposite that of the applied electric field that causes the current. The drift speed is tiny compared to the speeds in the random motion. For example. in the copper conductors of household wiring, electron drift speeds are perhaps 10-5 or 10–4 tells. 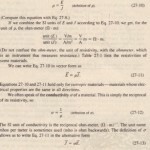 whereas the random-motion speeds are round Ioh m/s. We can use to relate the drift speed I’d of the conduction electrons in a current through a wire to the magnitude 1of the current density in the wire. 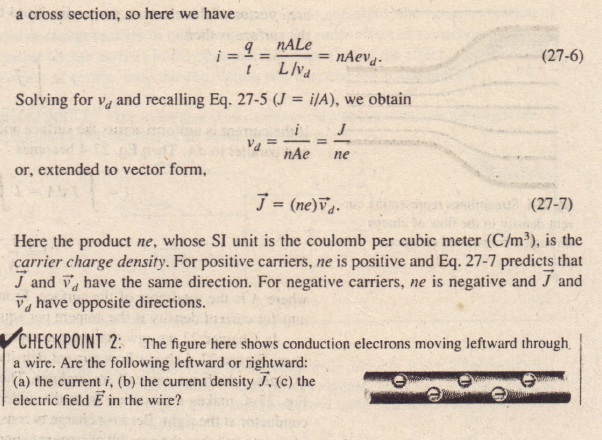 For convenience, shows the equivalent drift of positive charge carriers in the direction of the applied electric field E. Let us assume that these charge carriers all move with the same drift speed \'” and that the current density .I is uniform across the wire’s cross-sectional area A. The number of charge carriers in a length L of the wire is Nal, where n is the number of carriers per unit volume. The total charge of the carriers in the length L, each with charge e, is then. 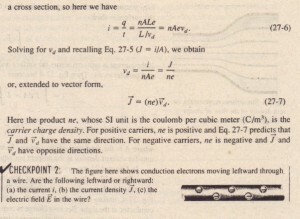 Because the carriers all move along the wire with speed I’d’ this total charge moves through any cross-section of the wire in the time interval.Equation 27-1 tells us that the current i is the time rate of transfer of charge across.